GCSE Maths students from six schools in Birmingham and Solihull visited The Sixth Form College, Solihull this week to get a taste of fun activities within the field of mathematics, as the annual Year 10 Mathematics Conference took place. Year 10 students from Lyndon, Arthur Terry, Arden, St Martin’s, St Edmund Campion and Tudor Grange Schools attended the full-day event, which was supported by the Further Mathematics Support Programme (FMSP). The annual event is designed to inspire and enthuse students with mathematics, by way of a variety of talks and practical workshops. 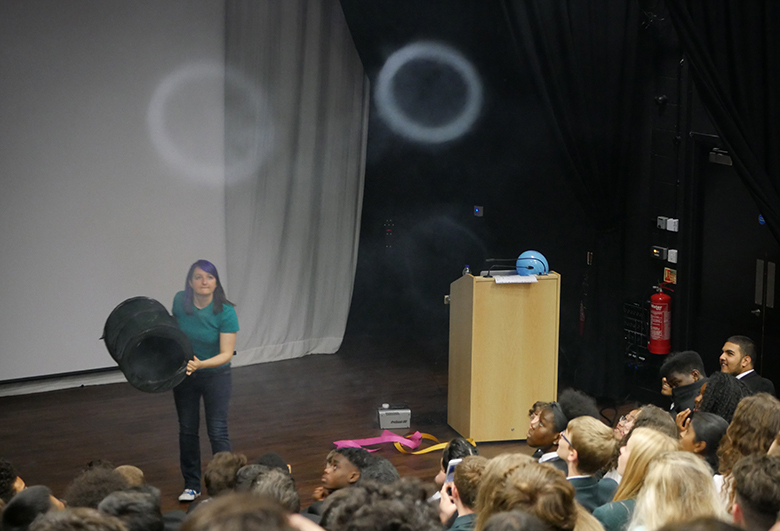 These sessions involved interesting and diverse applications of mathematics, from the mechanics behind “maths magic” to shapes and smoke rings! The speakers were Katie Steckles from the University of Manchester and Ruth Fairclough from the University of Wolverhampton. In addition, Derek Couzens, Avril Steele and Sharon Tripconey from the Further Mathematics Support Programme (FMSP) were present to deliver workshops. Mathematics is well provided for at the Sixth Form College. At present, the College offers three Maths-related A level courses: Mathematics, Further Maths and Statistics.